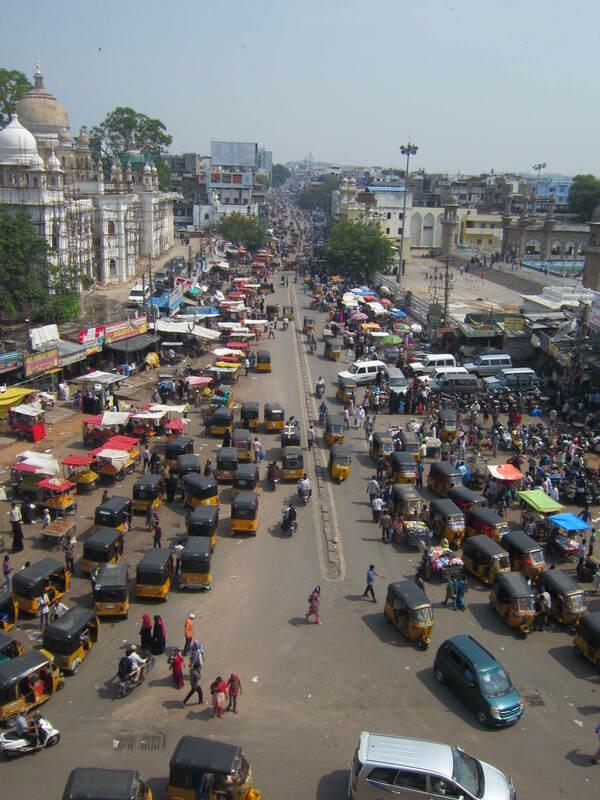 Hyderabad is known as a tech city in India because many companies are headquartered or have huge call centers there. From an outsider’s perspective it is not a place I thought to visit but we added it to our itinerary to visit friends of my traveling companion and boy, am I glad we did! With a willing local as our guide and expert driver we did some of our best shopping in this modern city. I will start by saying that Hyderabad had the most congested traffic I experienced in India and that is saying a lot because traffic is a circus in most Indian cities. That being said, I highly recommend using an experienced driver that knows the city’s ins and outs. It will save you hours and lots of headaches. There is no way we could have crammed what we did into one day without the help of a local. Standard traffic. A chaotic masterpiece. 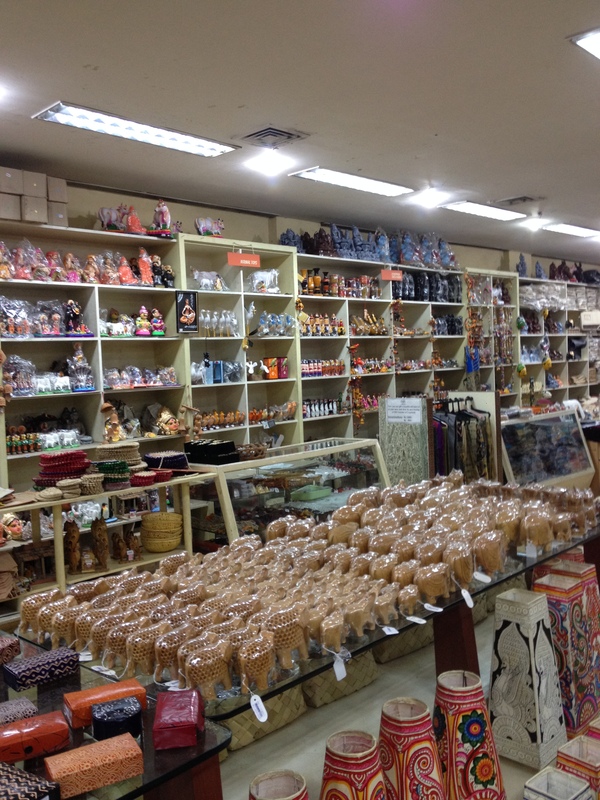 We first headed to Lepakshi Handicraft Emporium, a government run shop that highlights arts and crafts from different regions in India, all under one roof. They have about 20 locations in India, including one in Delhi. 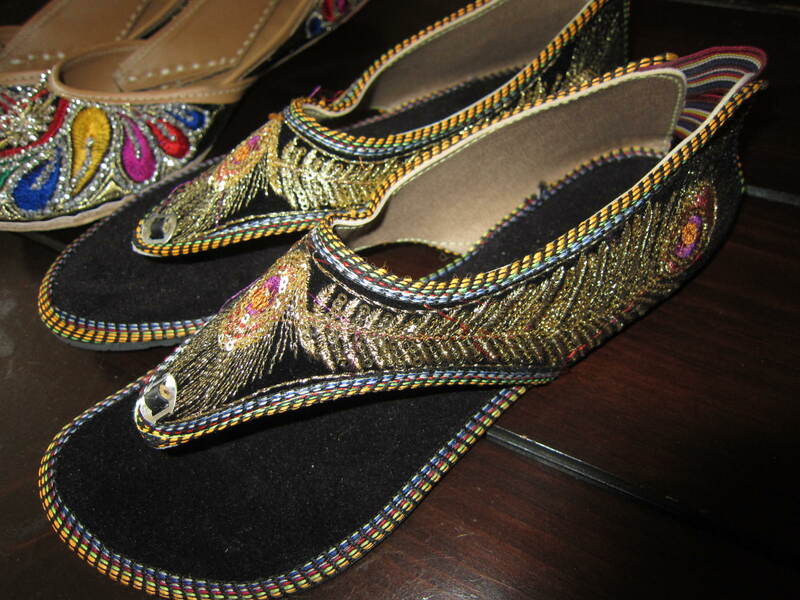 They offer wood carvings, jewelry, leather, textiles, art and much more. While there is no haggling like you’d find in the street markets, you can’t beat the large variety of items at reasonable prices. 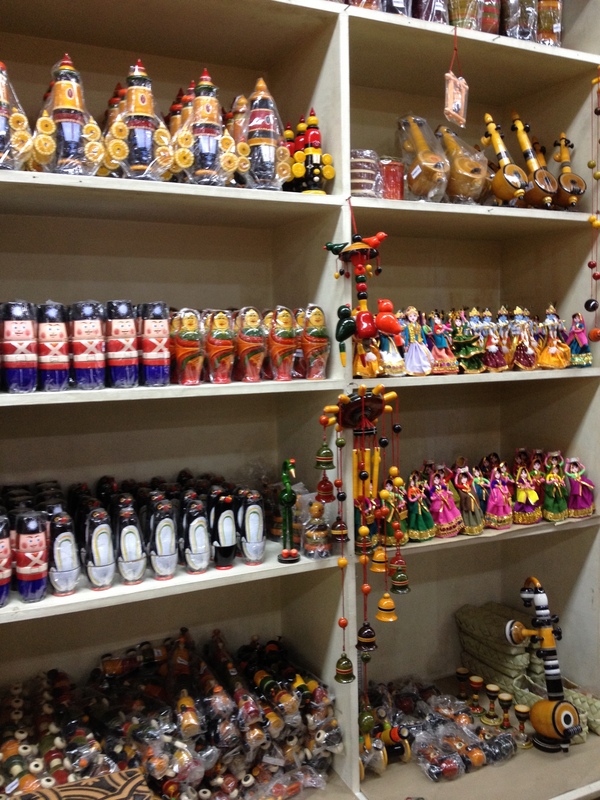 It is a great place to pick up souvenirs, without pressure to buy, in air conditioning and you can use a credit card. Handmade wooden toys for kids. 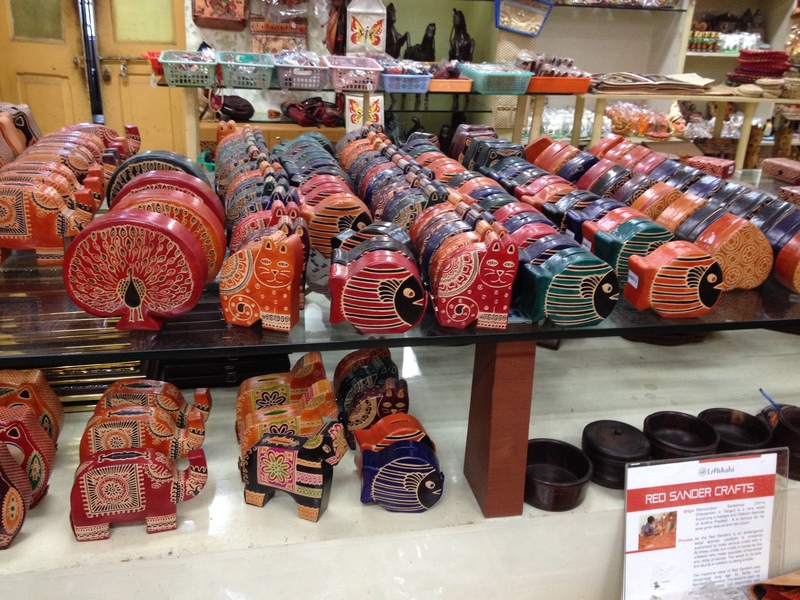 Leather coin purses and piggy banks. 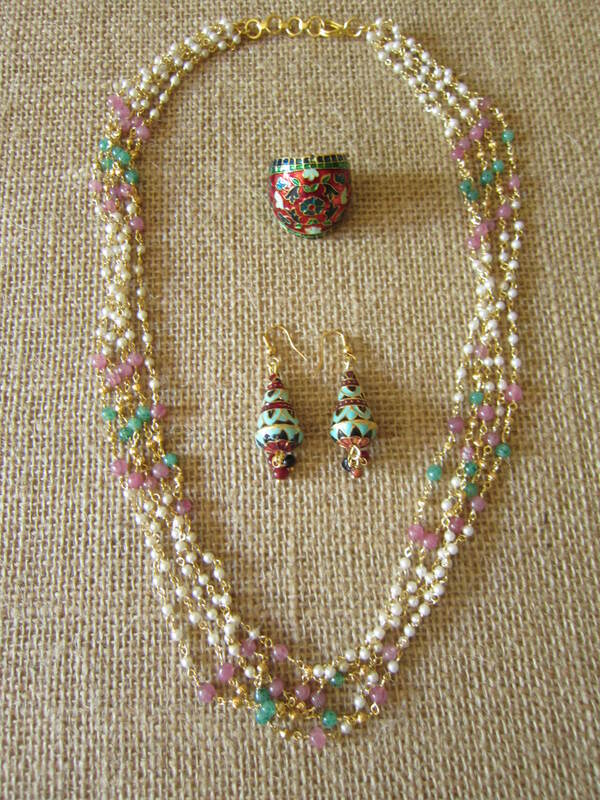 I bought a delicate multi-strand necklace, floral ring and dangle earrings. Softer and more dainty than I normally wear but I was drawn to them. I think the earrings have a cool Art Deco vibe to them. 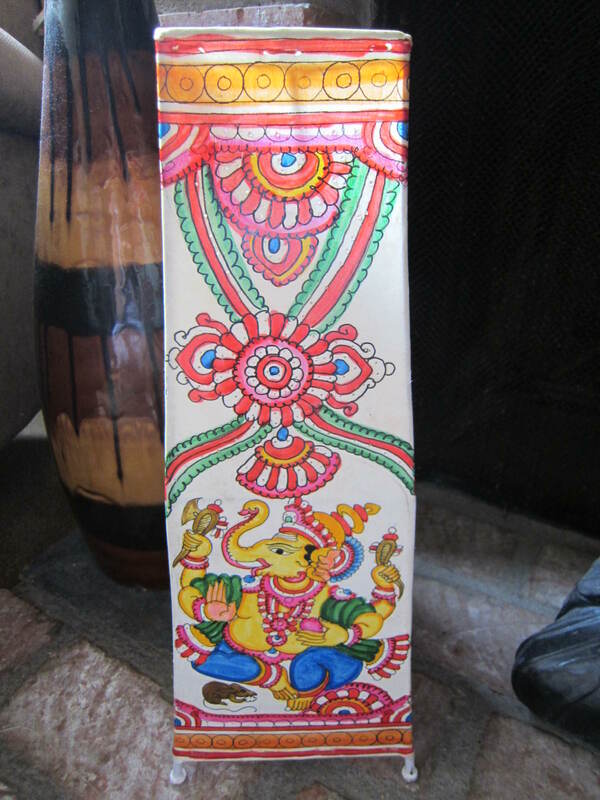 I also brought home this hand painted Ganesha lamp, which has found a happy home in my Indian inspired bedroom. 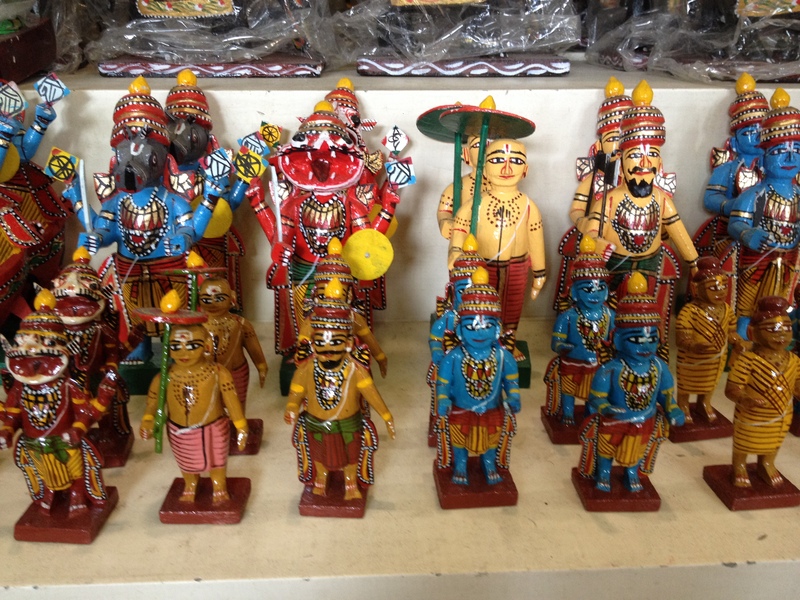 I also fell in love with these carved wooden musicians. They had them in different sizes, playing different traditional instruments and I had three that I loved. Again, I was told I could find them elsewhere so I didn’t buy them and did not see anything like them anywhere else we went. An ongoing travel theme for me is Non-buyers remorse. I have to learn to pull the trigger on items I fall in love with so they don’t get left in country when I don’t find them anywhere else. While Hyderabad has been heavily developed with industry in the last 20 years, the heart of the city is still steeped in history and tradition. We headed to Charminar, the four sided, quintessential landmark that lets you know you are in the city center. This monument marks the city’s commercial center and the surrounding streets are jam packed with shopping opportunities. 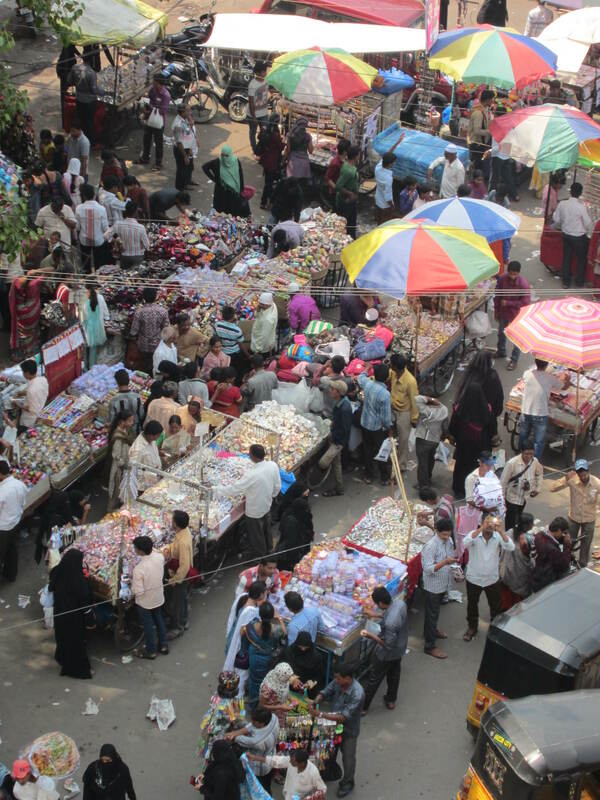 The view from at the top of Charminar, looking down at the bustling market. We did brave the steep, claustrophobic stairs to the top of Charminar and were rewarded with a wonderful panoramic view of the city. Once we thankfully made it to the bottom and made it out of Charminar, we traversed traffic on foot to the Lad Bazaar. This street is lined with bangle and jewelry shops. Hyderabad is known as the “Pearl City” and you can find all types of pearl jewelry here as well. 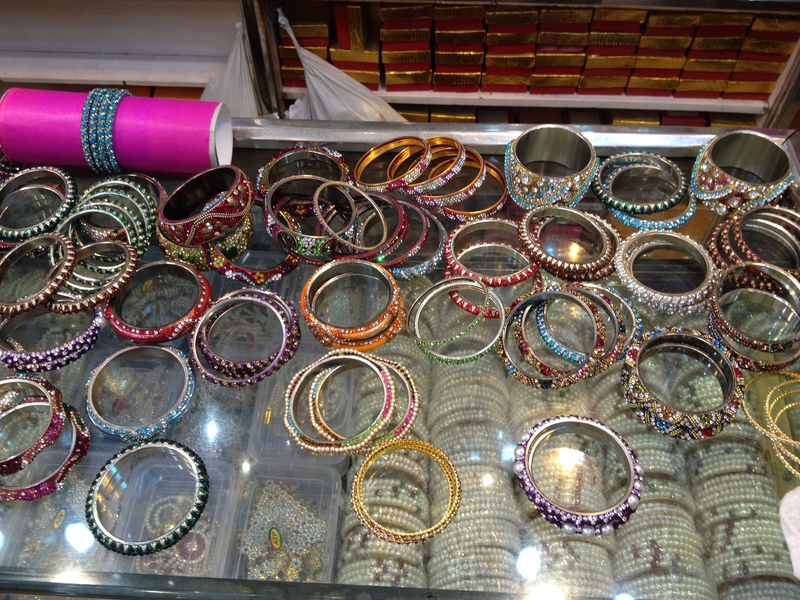 All of these photos of bangles are from the shop we bought all our bangles and pearls from. 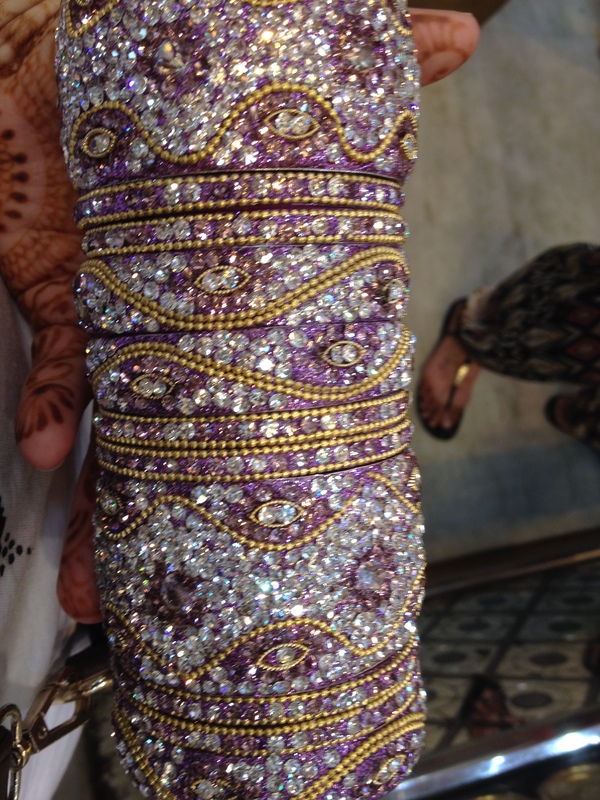 Sangam Bangles & Jewellers, 21-2-274, Lad Bazar, Charminar, Hyderabad. They were helpful, not pushy and gave us a great deal. 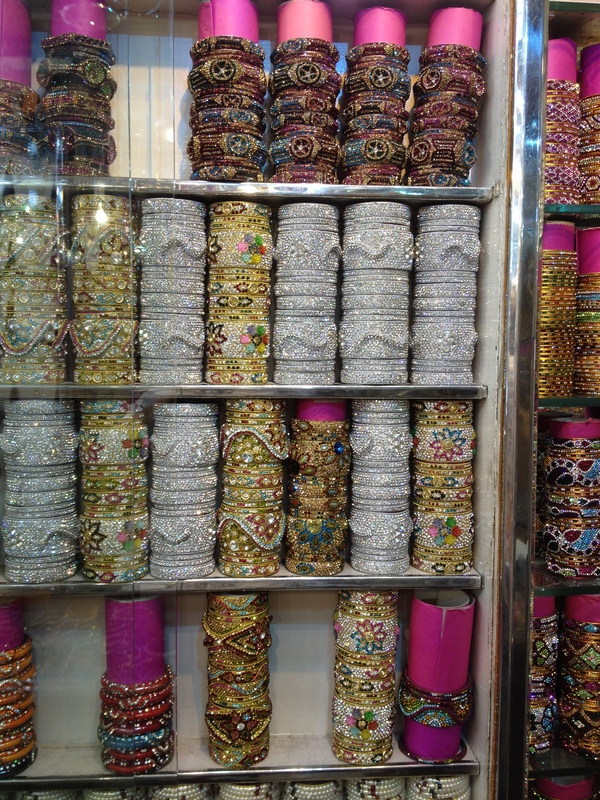 We spent the good part of an hour, trying on virtually every bangle they had to make our selections to take home. 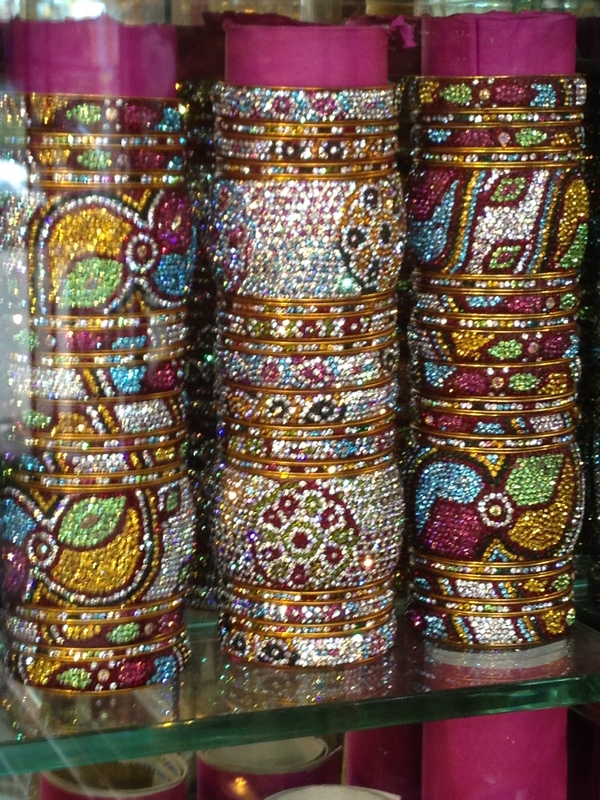 The bangles here are better quality than the Lakh bangles I bought in Jaipur. They are all reinforced with metal and fancier. Hyderabad is a mecca for Indian formal and bridal wear and the Lad Bazaar is where you find your sparkly bangles to finish your glam look. 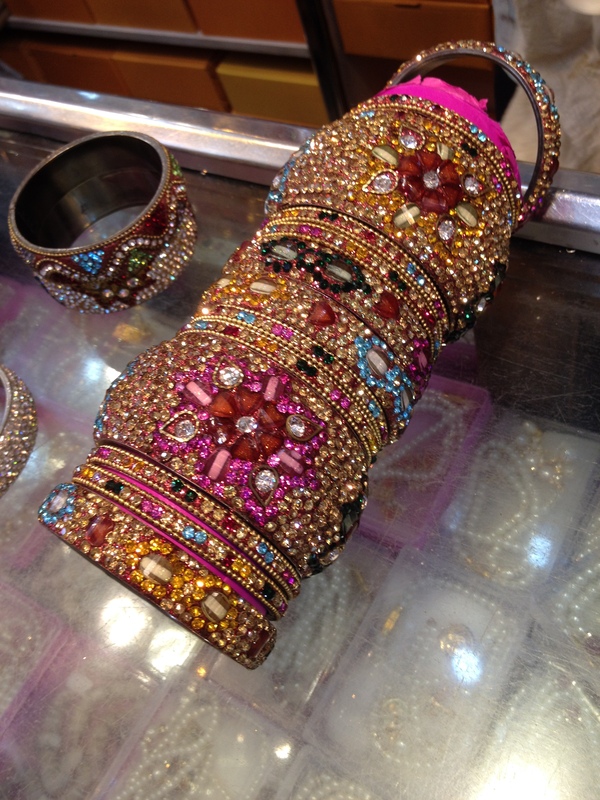 The bangles here are ornate and not really for everyday wear, but that didn’t keep me from buying way too many!!! What can I say, sparkles mesmerize a gal! 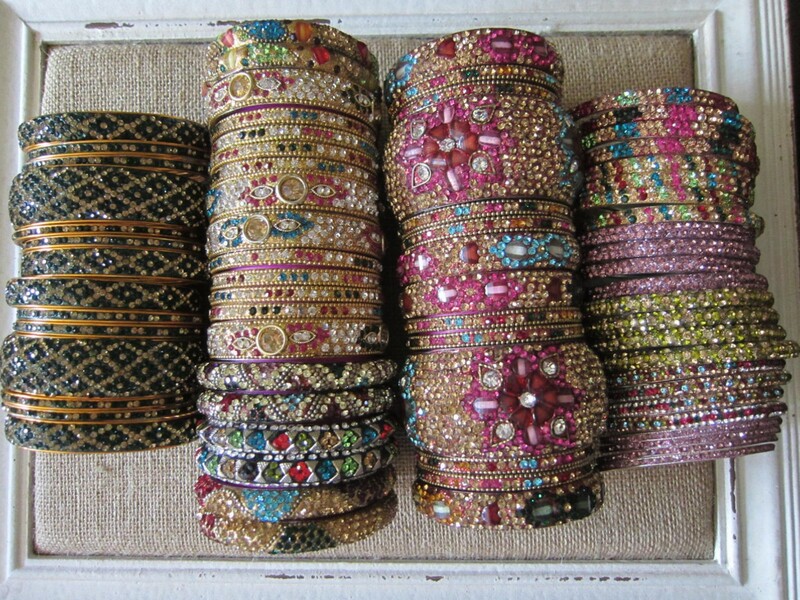 These are the bangles I ended up adding to my wardrobe. Don’t know where I’ll wear them all, but I am confident an occasion will arise at some point! 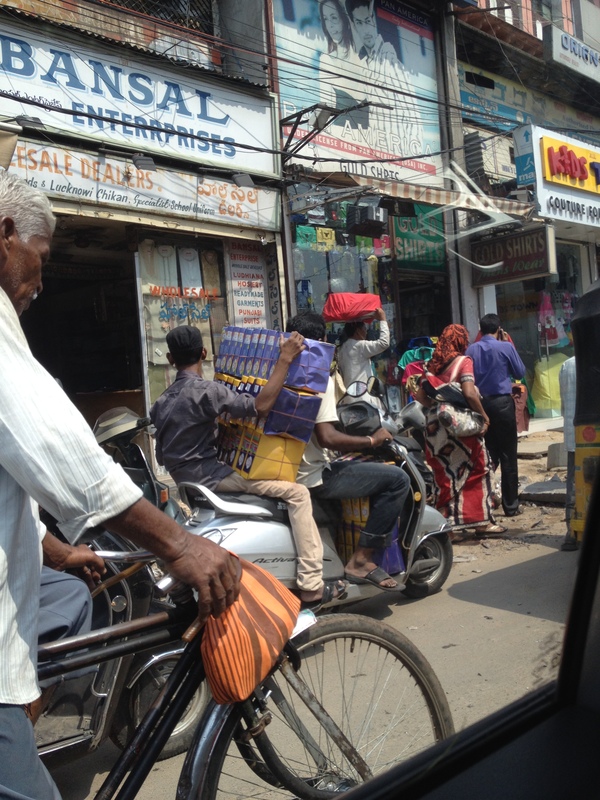 I had heard that Hyderabad was also known for perfume oils, so I was on the search. I still use oils I bought in Egypt years ago and I love to pick up unique oils and scents in different countries that I can’t find at home. With locals pointing the way, we continued the dance through traffic, to this hole in the wall perfume shop, Purandas Motilal. It’s not visible from the street, so you’ll have to ask where it is. The address is 22-6-65 Gulzar Houz, Charminar, Hyderabad 2. It’s worth hunting down. They have a good variety of lovely scents at extremely reasonable prices. 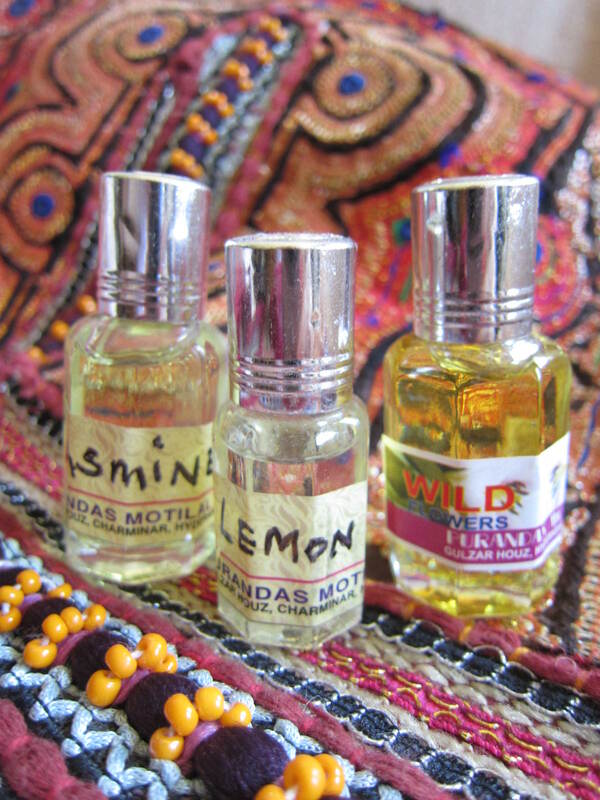 I bought scents that would remind me of India, a Jasmine/Sandalwood blend and a unique wild flower, as well as lemon for my diffuser at home. So I had picked up obscene amounts of jewelry, some perfume and what else could be on a woman’s shopping list? Shoes, of course!! 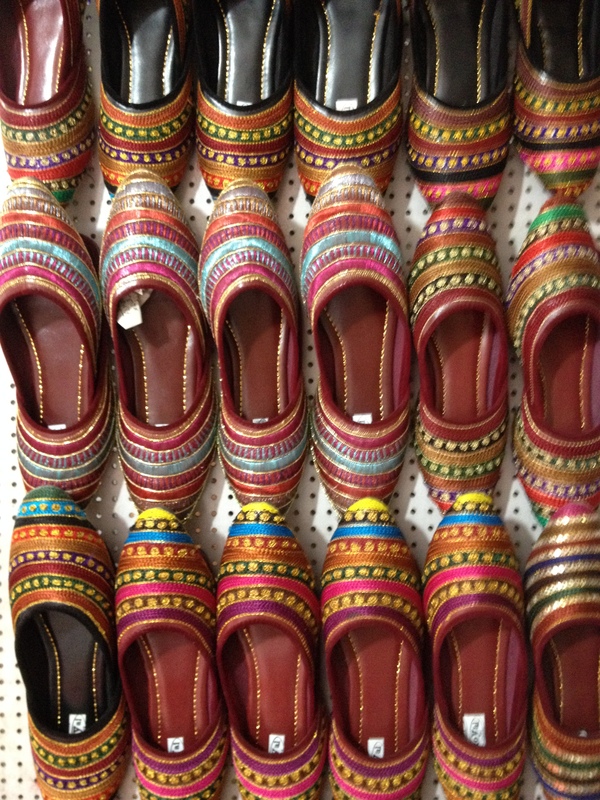 Handmade leather shoes and slippers are another one of Hyderabad’s specialties. Lucky me! 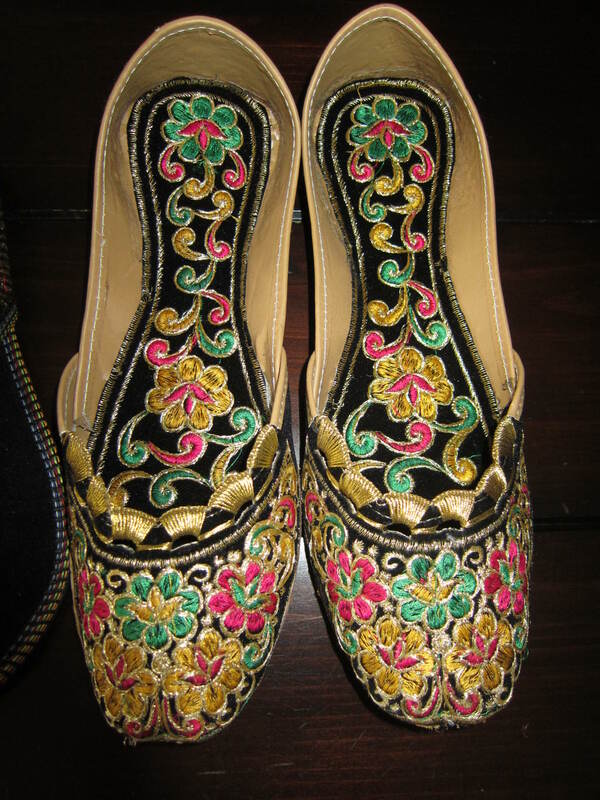 We took the car and as we headed out of the city center, along Nayapul Road, there are stalls after stalls selling these fabulous, embellished shoes. There are so many colors, designs and styles to choose from. Just don’t fall too in love with a pair as it may be the only one. I found the best plan of action was to tell them my size and the style I liked and they brought out a variety for me to choose from, all from this magical tiny door that went to some hidden stock room. 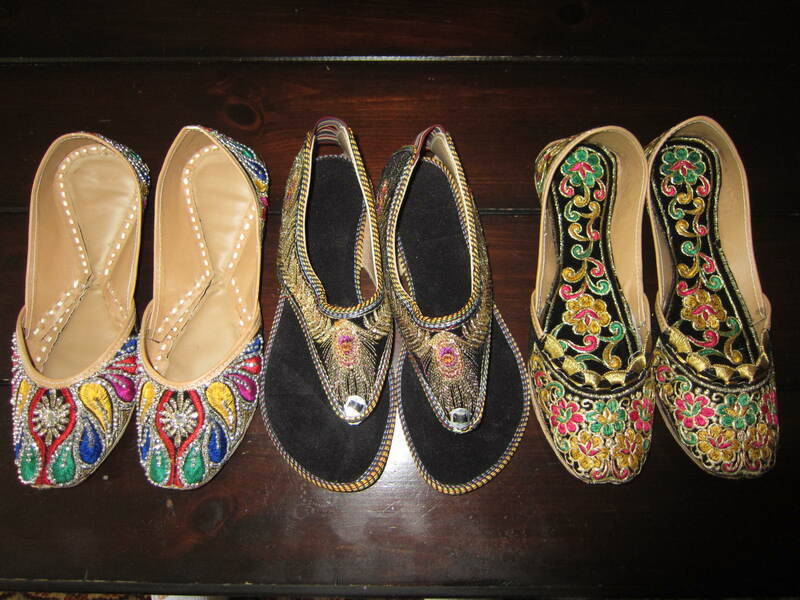 These are the three pairs I bought. 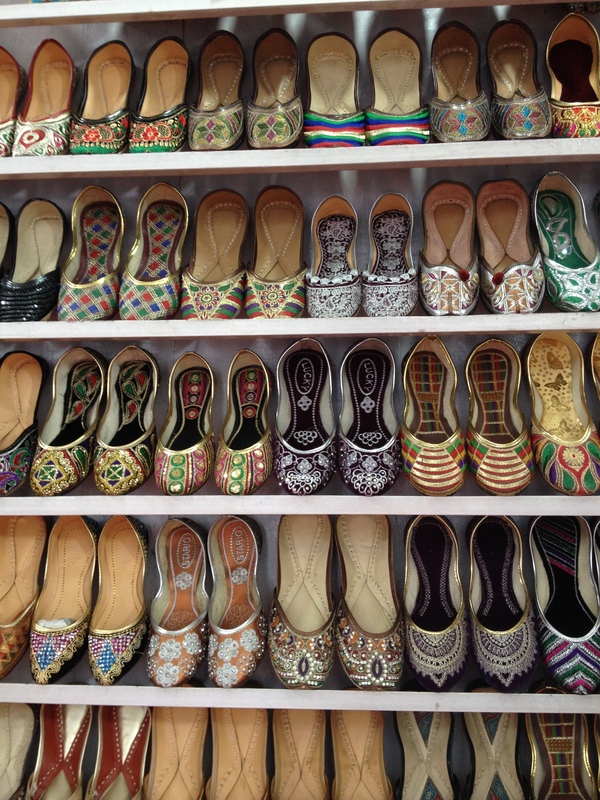 Along with my friend and our guide that needed a new pair of shoes, we bargained down the per pair price by buying quite a few pairs at once. Keep in mind there is a stall, on either side, that is ready to sell you shoes if you can’t a negotiate a price that you like. Lots of the same item in one place puts the bargaining power in your favor. 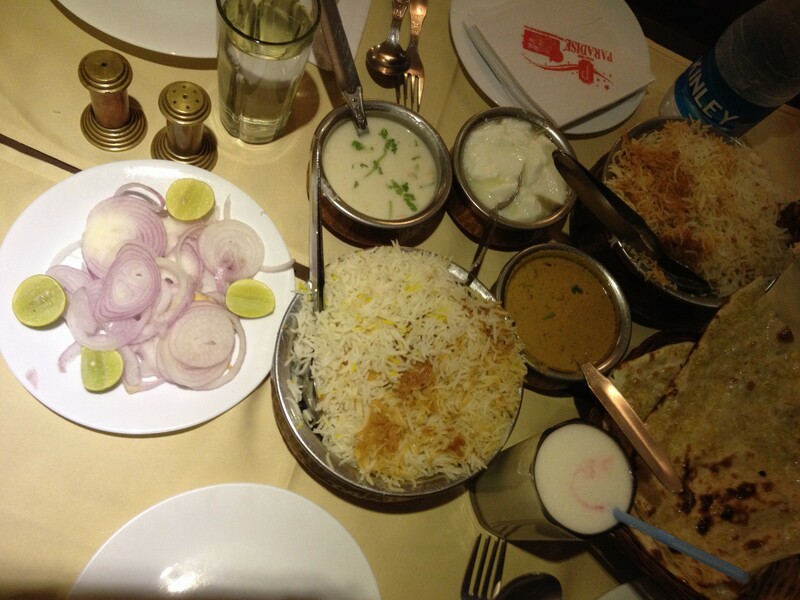 You have to eat the world-famous Hyderabadi Biryani while you are in town. I recommend Paradise Biryani for this delicious rice dish! Feel out each shopping situation for haggling. 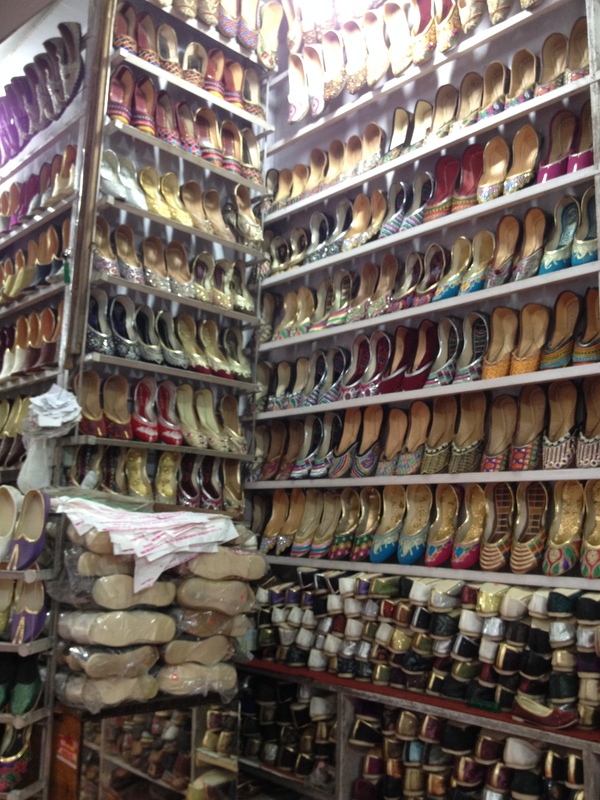 The government shops (the prices were set) and the perfume shop (the prices were so reasonable) weren’t places to bargain on price but we went toe to toe in the bangle shop and shoe stall. Remember to be respectful, haggling is not about insulting, it’s a dance that varies by culture, where both parties should leave with feeling good. You should make a new friend with each successful bargain! Take a relaxing dip in the pool after a long day of shopping adventures! Infinity pool on the 10th floor of the Trident Hotel. Your pictures are so dope! Thanks so much. Still feeling out if readers like my travel/shopping posts. They take quite a bit of time to write but I like to share my treasures and adventures. 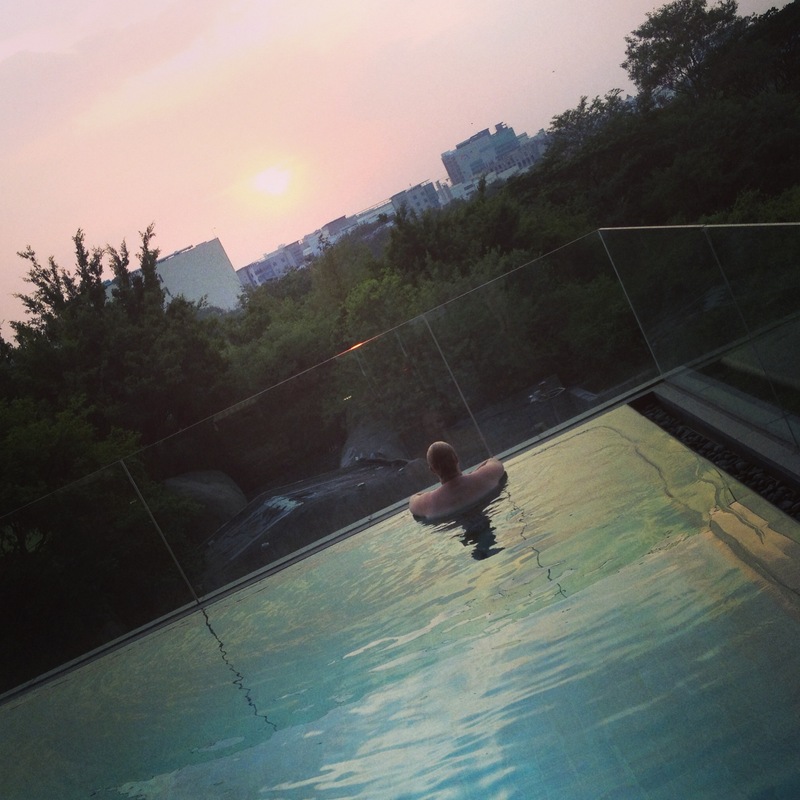 We weren’t even going to check out the pool at this business hotel but we were so glad we did. It was so beautiful on the 10th floor. A wonderful reprieve from plane travel earlier in the day! Would you mind sharing the prices of the bangles?